who said eco-friendly vehicles need to be boring? Hyundai has brought this philosophy to life with the IONIQ Electric, IONIQ Hybrid, and IONIQ Plug-in Hybrid. but also demonstrates Hyundai’s commitment to creating engineering innovations with our owners in mind. Forget everything you ever thought about hybrid and electric cars. Depending on how you drive, how far, and how often, each IONIQ has its electrifying advantages. Once you get to know them, it’ll be easy to decide which one is right for you. IONIQ Hybrid combines a highly-efficient 1.6L gasoline engine with a powerful 27 kW electric motor for impressive performance and fuel efficiency. For unmatched responsiveness, it also features the first-ever Dual-Clutch Transmission (DCT) in a hybrid vehicle. Each element of the IONIQ Hybrid’s Blue Drive powertrain works in harmony to give you the fuel economy you’ve always wanted from a hybrid vehicle with a driving experience that’s more engaging than you ever thought possible. The IONIQ Plug-In is a compelling alternative to the Hybrid. Its larger 8.9 kWh Lithium-ion Polymer battery feeds a more powerful 45 kW electric motor, delivering up to 37 km (est.) of all-electric, emission-free driving. Together with the high-efficiency gasoline engine it delivers a power boost with no compromise on maximum driving range. Plus, the battery recuperates energy on the move and can be recharged via an external power supply. Now that’s power worth plugging into. IONIQ electric – No emissions. No compromise. All the science, without looking like a project. 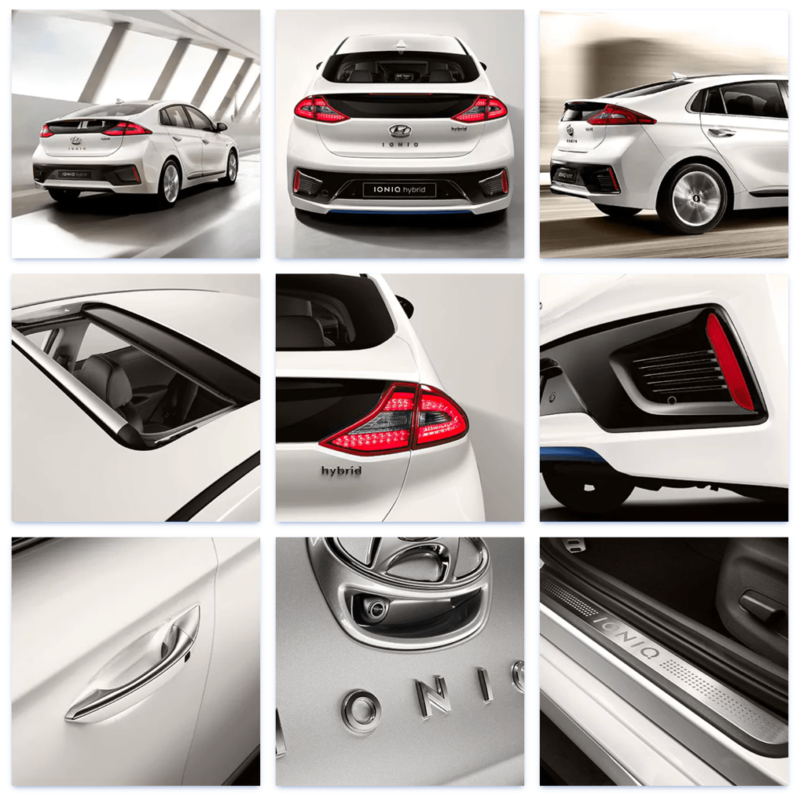 The Hyundai IONIQ Electric’s 88 kW motor is powered exclusively using energy stored in the vehicle’s 28 kWh Lithium-ion Polymer battery pack. On a full charge, IONIQ Electric offers up to 170 km (est.) of emission-free driving. Since the battery is located low in the chassis, it lowers the car’s centre of gravity, which is key to a rewarding and responsive drive. IONIQ is the only vehicle in the industry to be powered by a choice of three different electrified powertrain options. The vehicle’s lightweight structure was designed from the ground up to offer enhanced efficiency and a responsive driving experience. Who ever said that fun and frugality were mutually exclusive? Just as important as advanced power train technology are aerodynamics and a lightweight, high-strength vehicle structure. IONIQ ticks all of these boxes. With a drag coefficient of just 0.24 the IONIQ is one of the most aerodynamic cars on the market. The sleek silhouette and finely tuned details harness airflow to minimize air resistance and emissions. Front air intakes reduce turbulence around the front wheels, and C-shape LED Daytime Running Lights create an unmistakable presence on any street. IONIQ both tames the wind and electrifies the senses. intuitive operation, making it effortless to immerse yourself in the driving experience. Look for the All-New Hyundai IONIQ hybrid, IONIQ plug-in hybrid, and IONIQ electric to arrive in our Port Hope, Ontario showroom in the fall of 2016. Lauria Hyundai is proud to service the Port Hope, Cobourg and Northumberland region and was honoured to be named Canada’s #1 Hyundai dealer for overall customer satisfaction for 2015. Do you live in the Clarington, Oshawa, Peterborough, or Belleville area? 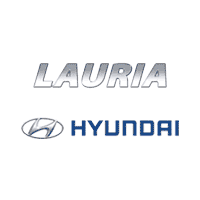 Lauria Hyundai’s new car prices are guaranteed to be the lowest and if you bring us a quote from a different dealer we will beat it. Only a 25 minute drive from the Clarington Hyundai and Oshawa Hyundai area, or a 25 minute drive from the Peterborough Hyundai region as well! Come in today to find out why Lauria Hyundai in Port Hope was ranked the #1 overall Hyundai dealership across all of Canada in 2012. If you are looking for a Hyundai Hybrid vehicle, this is the place to go. If you have questions about the Hyundai IONIQ, IONIQ plug-in Hybrid, or IONIQ electric please contact us and we will get back to you with an answer right away. Think Smart, Think ECO, Think IONIQ and Lauria Hyundai!